As we work our way through the sites featured in the brand-new Tower Site Calendar 2005, now available right here at fybush.com, we can't resist the opportunity to showcase the photo at right, which you'll find as the January 2005 image in that fine publication. As we retrieved that presentation from the archives to share it with you again, we realized that so much has changed up there on the hill that we needed to bring you several new photos and a few new stories as well...so what we have here is a sort of a hybrid between a repeat and a new episode. As NBC used to say, "It's new to you!" So without further preface, here's that 2000 Site of the Week - but then keep reading for all the new information and exciting new photos down at the bottom of the page, too, won't you? 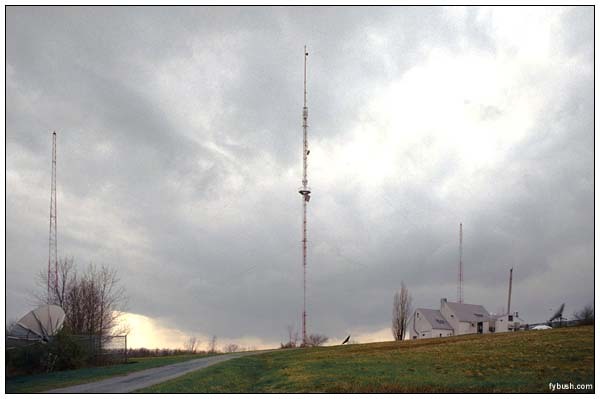 High in the hills south of Binghamton, a stone's throw from the Pennsylvania line, sits the cluster of towers that supplies the region with all of its TV, most of its FM, and the market's top-rated AM. WHWK transmits with 10,000 watts from 960 feet above average terrain, just below the Channel 12 antenna in the picture to the left. Channel 12, of course, is no longer WNBF-TV, and hasn't been for decades. But as WBNG-TV, it still shares a site with its former radio partners. One more station joined them at this site in the late nineties. 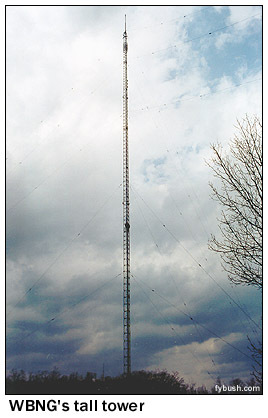 WYOS (104.1 Chenango Bridge) is a class A drop-in that uses 930 watts from 833 feet AAT, on the center tower of the WNBF array. If the WNBF/WBNG site were the only thing on Ingraham Hill, it would be interesting but hardly distinctive. Thankfully (at least for those of us passionate about tower farms), it's hardly alone up there. Just down Ingraham Hill Road is the tower that's home to three more TVs and several FMs. Binghamton broadcasters know this one as the "Stainless tower," for the Pennsylvania-based tower firm that built it when it bought the city's NBC affiliate, WINR-TV (Channel 40). WINR-TV had been operating from the transmitter site of its sister station, WINR (680), on Windy Hill near the psychiatric center northeast of downtown Binghamton. That tower still stands, but it's not very tall, and it required viewers to swing their antennas around in order to tune away from dominant Channel 12. With just 575 kW visual from 630 feet above average terrain, the old channel 40 signal can't have been very impressive. When WINR-TV became WICZ (the last four letters of the last name of Stainless' owner, Henry Guzewicz! ), it moved to one tine of this big candelabra. By 1971, WICZ was running its 565 kW visual from a much more impressive 1,231 feet above average terrain. Joining it on this tower (actually, preceding it by a few years) was Binghamton's new public television station. WSKG-TV (Channel 46) began broadcasting from the candelabra in 1968. 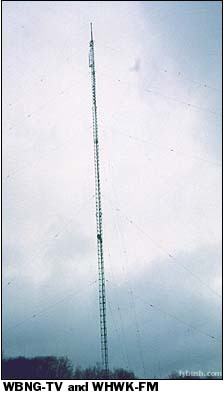 WSKG-FM (89.3) came along in the seventies to join its TV sister, and it too uses this tower. 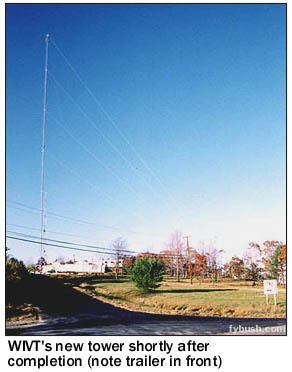 Next up on the big stick was WAAL (99.1), the former WKOP-FM, which had been using 33 kW from 440 feet in its previous incarnation (perhaps from the WKOP 1360 towers on a nearby hilltop in the Town of Binghamton?) before jumping up to the Stainless tower with a mighty 50 kW from 1090 feet AAT in the seventies, thus becoming Binghamton's most powerful FM signal. A few more stations joined the Stainless tower family in the years that followed. A new class A station, WMXW (103.3 Vestal), signed on in 1989. A few years later, WICZ switched networks from NBC to Fox, leaving an affiliation hole that was soon filled by a new low-power TV station. WBGH-LP (Channel 8) operated from Ingraham Hill as well, initially as a simulcast of Elmira's WETM-TV (Channel 18), and later as a sister station of WIVT (Channel 34) - but read on for that story. Trinity Broadcasting has an LPTV on the Stainless tower. Formerly on channel 14, it's now W26BS. There's still one more TV signal up on this hill, and its story just might be the most interesting of them all. WBJA(TV) was originally allocated to channel 56, but it was able to move to channel 34 before its 1962 debut, thanks to the merger of two failing UHF stations an hour to the south. WILK-TV (Channel 34) in Wilkes-Barre gave up its allocation when it merged with WARM-TV (Channel 16) in Scranton to form the new WNEP-TV. WBJA was an ABC affiliate, and for three decades the lowest-rated station in the market. It was also the only Binghamton station whose studios were up on Ingraham Hill. One NERW reader once related to us the story of driving up the hill with other teenagers in the 1960s to be part of the audience at WBJA's after-school "American Bandstand"-style dance party, and the wild ride back down into town afterward. In the late seventies, WBJA was sold and became WMGC-TV, "Magic 34." Your editor fondly remembers the ID slide the station used circa 1980, featuring a pair of magician's hands, a rainbow, and the WMGC call letters. The new calls didn't do much for the ratings, and WMGC remained a ratings also-ran well into the nineties. Then, in the space of just a few months in 1997 and 1998, everything changed at Channel 34. A new owner, Ackerley Broadcasting, took over and began investing money into the station's news operation. With resources shared with Ackerley powerhouse WIXT (Channel 9) up the road in Syracuse, the newly-renamed WIVT was poised to become a force in Binghamton news for the first time. 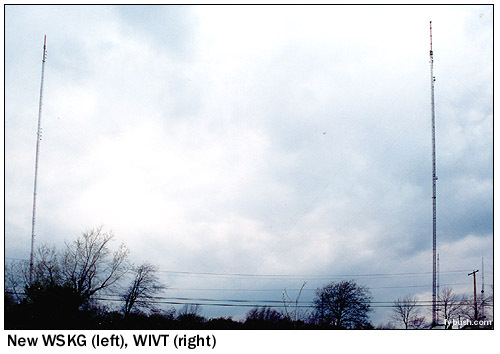 On the afternoon of Sunday, May 31, 1998, WIVT's revival came to a literal crashing halt. Tornado-force winds blew across Ingraham Hill, ripping holes in the channel 34 building as terrified master-control operators cowered beneath the board. Worse yet, when the board operators came up for air, they found the channel 34 tower demolished. WIVT remained off the broadcast airwaves for several months, though a feed to local cable companies was back up and running with network programming within several days. Local programming resumed a few days later, from temporary studio space leased from WSKG-TV in Vestal. Your editor drove up the hill about a week after the storm, to find a big blue tarp covering much of the damaged WIVT building and a guard with a pickup truck and a mean-looking dog suggesting we move on -- which we did! 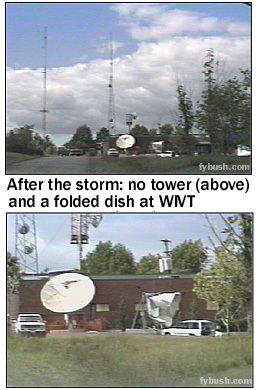 By the fall, a new tower was up at the WIVT site, and broadcasting had resumed on channel 34. 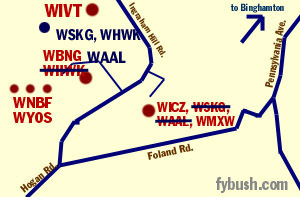 The damage to WIVT was the worst on the hill, but other stations suffered as well. 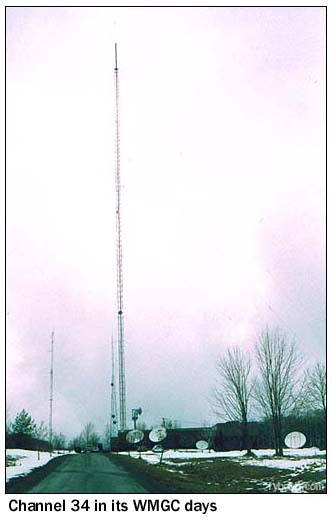 One of the self-supporting towers in the WNBF array shown above (most of the pictures on this page were taken on a snowy New Year's Eve 1995, long before the storm) was toppled in the high winds. For quite a while thereafter, WNBF operated with reduced power at night from the remaining two towers. A few footnotes to our Binghamton story: When digital TV comes to the Southern Tier, Binghamton will become a mostly-VHF market for the first time in its history. WIVT-DT will be on channel 4, matching its call letters and its cable dial position. WICZ-DT will be on channel 8, and WBNG-DT on channel 7. So much has changed on Ingraham Hill in just four years that it's hard to know where to start - so we'll begin with some history, first: Bruce Fanning checked in from southern Colorado to share some of his knowledge of his hometown sites, and since his career included stops at most of these stations, we're delighted to be able to benefit from his expertise. Bruce notes that WNBF began its long history down in the valley below, signing on in 1927 on 1450 kHz and spending the thirties on 1500 kHz with 250 watts. By 1936, it was operating from a tower on the west side of Binghamton. The NARBA shift of March 29, 1941 would have moved WNBF to 1490, but if it ever operated there, it wasn't for long - by September, WNBF had begun construction on the Ingraham Hill site, which saw it move to 1290 with 5,000 watts. Now, here's where it begins to get interesting: back then, all four of the towers on that site were used as part of the AM array, including that thousand-foot monster that's now used by WBNG-TV! It seems that the big stick, though built with eventual TV use in mind, was also a Franklin antenna, fed at the center insulator. And the middle tower in what's now WNBF's three-tower array was center-fed, too. Here's Bruce: "The middle tower is twice the hight of the self supporting towers, like the Franklin this middle tower has insulators halfway up, but it was (I don't know about today, but I would bet it's still the same) feed at the base of the tower. Three relays, one on each leg, "break" it in half electrically. The 2 self supporting towers and the bottom half of the middle tower are used for nighttime directional operation. Close the relays and this middle tower became live top to bottom and was the backup for the Franklin. A new 5000 watt Westinghouse transmitter was installed for WNBF soon to be at 1290 am. The transmitter building was (still is) huge! 4 full floors with a full kitchen, showers, bed/bunkrooms, a big garage, 2 well systems, workbenches for weeks, the 5kw am xmitter and phasing cabinets on the south wall, FM along the south end of the west wall, and TV filling the balance of the west wall and all of the north wall. Power supplies and distro all in the basement. A very large backup generator inside a separate room down the steps on the east side." About that FM: just a week after WNBF signed on at 1290 from Ingraham Hill, W49BN signed on (at 44.9 MHz, of course) from the top of the Franklin, among the first 15 FM stations in America. It would later become WNBF-FM at 100.5, then at 99.1 (WKOP-FM, which would later operate at 99.1, was then at 95.3), then finally at 98.1, and would eventually move down from the top to the side of the tall tower when WNBF-TV 12 signed on in 1949. In 2000, it was still there, operating as WHWK after a couple of call changes - but by 2004, it had vacated channel 12's tower, and here's why: its owner, Citadel, upgraded another station south of the state line (WBSX 97.9 Hazleton PA) by moving it north to the main Wilkes-Barre tower farm. Though 97.9 and 98.1 are both pre-1964 grandfathered allocations, interference protection between the two signals some 60 miles apart could only be accomplished by moving 98.1 north by less than a mile. So north it moved - and we'll see where it went in just a moment. Never a company to waste a dime, Citadel's making good use of its rental space on the channel 12 tower - it's relocated WAAL (99.1) from the Stainless tower across the road to a new antenna on the channel 12 stick. And there's one more bit of updating to be done to that 2000 material above: not long after that was written, WKGB (92.5 Conklin) moved from the remote Windsor site to the south tower of the WINR (680) array up on Windy Hill, providing a much-improved signal to Binghamton from the very spot where WINR-TV began all those years ago. Which reminds us that we never did get to that promised look at the rest of the Binghamton AM sites. We'll have to rectify that soon! Next Week: We (Still) Love L.A.